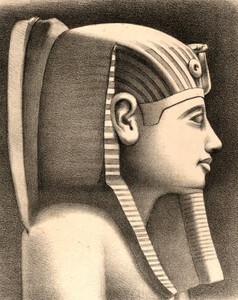 Horemheb was commander in chief of the army and the designated heir to Tutankhamun. The vizier Ay managed to seize power when Tutankhamun died suddenly, probably while Horemhab was abroad with the army. However, Ay died after only a few years reign, and Horemheb finally ascended the throne. It is not known how he managed it, but presumably it was well known that he was the intended heir to Tutankhamun. Horemeb initiated a return to religious normalcy by restoring the old gods to power, reducing the worship of Aten introduced by Akhenaten to rubble. He furthermore started erasing all traces of their reign and history, and was very successful, as the Amarna period kings were more or less forgotten. Horemheb might be the Armaa mentioned in a historical text of the Hittite king Mursili II, written when Horemheb was the commander of the armies of Asia, before he became pharaoh. This name seems quite similar to the Armais/Armesis of Manetho. Horemheb failed to produce a son, so instead he appointed his vizier, Paramessu, to succeed him, which he did as Ramesses I.